Do You Have an Unknown Criminal History? We’ve all been told it’s important to check your credit history once a year, but have you ever thought about checking into your criminal history. Some people are finding out that even if they’ve never been convicted of a crime, they have a record. Since 2010, more than 1.5 million people have asked the FBI for a copy of their record. The vast majority, 78 percent, had no arrest information in the FBI Criminal File. 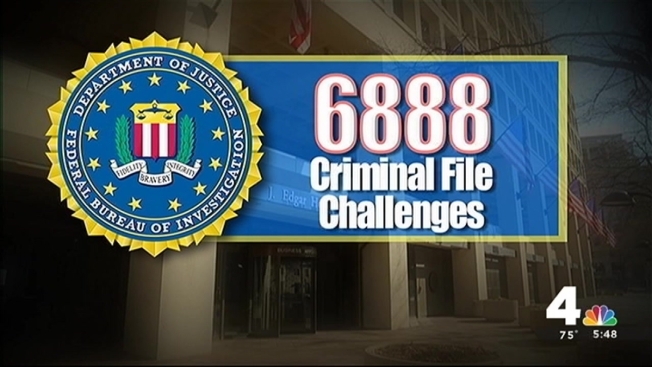 But in that same time period, the FBI received 6,888 challenges with more than half of them eventually being changed. D.C. resident Myron Jones is all too familiar with the problem. He owns up to a few run-ins with police in the past, including a 2010 misdemeanor assault charge, but he says he’s worked hard to turn his life around and be a role model. “I went into school as a goal to be a juvenile probation officer because I came up in the inner city, and a lot of youth look up to me,” Jones recently told the News4 I-Team. But a recent FBI background check at a halfway house where he worked uncovered a history he can't move on from. It included crimes he said he never committed, including car theft and armed carjacking, a violent felony that’s possibly been linked to his name for almost 20 years. He now wonders how many jobs it might have cost him over the years. “I've had an employer send me down to take a drug test, ready to hire me. But once I turned in my background check, I heard nothing else from them. It hurts, because this is what I wanted to do, and it's holding me back”, said Jones. "I'd say it's more common than people think,” Federal Employment Attorney Mark Zaid said. He explained correcting those mistakes on your criminal record can be incredibly frustrating, time consuming and costly, especially if you have a lawyer do it. "The governments that maintain these databases need to set up a better system so that when there is problem there is a mechanism by which you can challenge it," said Zaid. Myron suspects the mistakes on his record resulted from identity theft after someone stole his driver’s license years ago. Since then he's been working to clear his name, going from one courthouse to the other in three different jurisdictions. He recently turned to D.C.'s Public Defenders Service for help. "This can be extremely damaging,” said Keisha Robinson, an attorney with The Public Defender Service. "We serve hundreds of clients every year who come to our doors seeking relief for records that are incorrect, they're inaccurate or they've been arrested and it was thrown out of court and they thought they didn't have a record." Robinson said it can take about six months to hear back from the court on whether a motion has been granted to seal a criminal record. She suggested if you suspect something is inaccurate with your record you should request a copy of your “arrest history report” with your local police department and your court record. Myron worried his criminal record would keep him from being able to coach his son’s baseball team, something that required a background check. "I feel like I'm stuck with being an armed carjacker," he said. "That's how it feels.” He eventually got cleared to coach. Until he’s able to clear his name in the FBI Criminal File, he’s carrying around a piece of paper he received from the courts saying it has no record of him being a defendant in a carjacking case. Click here for more information on how to challenge your criminal history with the FBI. Click here for more information about The Public Defender Service for the District of Columbia or call 202-628-1200.